The first part of this Encounter allows students to carefully consider one place setting. They engage in an activity to practice describing and interpreting an artwork that is not part of The Dinner Party before investigating the meaning of a single place setting. Students are guided through the process of looking carefully at the one place setting and constructing interpretive statements about its meaning. 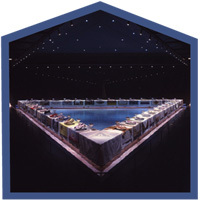 In the second part of the Encounter, the students apply what they have learned to the investigation of meaning of another place setting at the table. This Encounter provides opportunities to practice critical thinking and language arts skills. 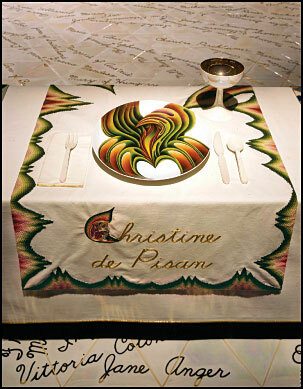 It is crucial that students investigate individual place settings to see how the artist infused her artwork with what she and her collaborators learned from their research about each of the women. Students will note the way important attributes of the featured woman are presented symbolically in the various components of the place setting. Students will become experts about a woman at the table. By researching information about their assigned woman, students can better understand the symbolism and ideas in her place setting. To view the entire Encounter, download the PDF for Encounter 8: Investigating Meaning and its Classroom Connections by clicking on the buttons below.